My Ultraman collection has a few piece that leave me scratching my head .. wondering what the idea was behind some of these items. 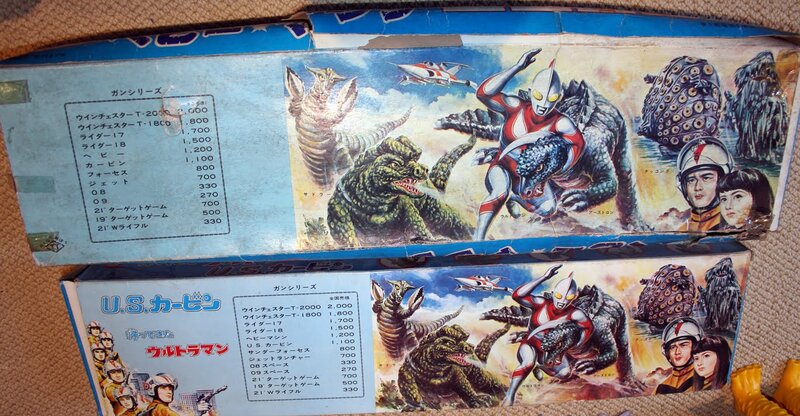 A pair of these are these Ultraman Jack ( Return of Ultraman ) army type guns. Both of these come in fairly large size window boxes (Each box measures 26 inches long.) and contain a M16 style plastic gun and a more heavy duty machine style gun. Both examples have seen better days as far as condition and one is missing a tripod for it’s base…but I have not seen these before so of course had to add them to the collection. Each one operates on batteries and have sound effects and light up at the barrels end.